Make yourself at home in one of the 101 air-conditioned rooms featuring kitchens with full-sized refrigerators/freezers and ovens. Rooms have private balconies or patios. Complimentary wireless Internet access keeps you connected, and cable programming is available for your entertainment. Conveniences include desks and microwaves. When you stay at La Dolce Vita Resort & Spa - Gay Men's Clothing Optional in Palm Springs, you'll be in the entertainment district, a 2-minute drive from San Jacinto Mountains and 6 minutes from Palm Springs Convention Center. This spa hotel is 4.2 mi (6.7 km) from Palm Springs Aerial Tramway and 1.8 mi (2.9 km) from Palm Springs Art Museum. Enjoy a satisfying meal at Cantala serving guests of The Riviera Palm Springs, a Tribute Portfolio Resort. 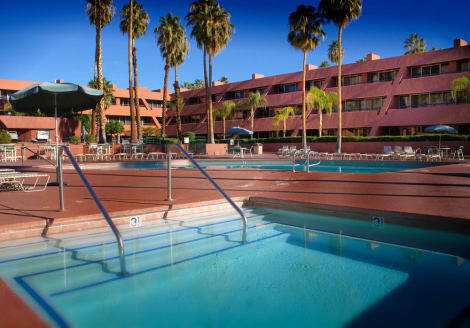 With a stay at Motel 6 Palm Springs East-E Palm Canyon in Palm Springs, you'll be a 1-minute drive from San Jacinto Mountains and 6 minutes from Palm Springs Convention Center. This motel is 4.5 mi (7.2 km) from Palm Springs Aerial Tramway and 2.1 mi (3.4 km) from Palm Springs Art Museum. Enjoy recreation amenities such as a spa tub or take in the view from a garden. Additional features at this motel include complimentary wireless Internet access, wedding services, and a television in a common area. Getting to nearby attractions is a breeze with the complimentary area shuttle. Featured amenities include a business center, complimentary newspapers in the lobby, and dry cleaning/laundry services. Planning an event in Palm Springs? This motel has 500 square feet (46 square meters) of space consisting of conference space and a meeting room. Free self parking is available onsite. Don't miss out on recreational opportunities including an outdoor pool and a spa tub. Additional amenities at this hotel include complimentary wireless Internet access and tour/ticket assistance. lastminute.com has a fantastic range of hotels in Palm Springs, with everything from cheap hotels to luxurious five star accommodation available. We like to live up to our last minute name so remember you can book any one of our excellent Palm Springs hotels up until midnight and stay the same night.